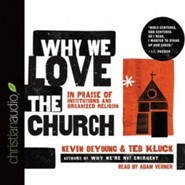 Whether you're committed, disgruntled, hesitant, or disconnected from the body of Christ, this passionate resource will help you renew your love for the church in all its real-life guts, gaffes, and glory. DeYoung and Kluck's valuable resource provides a solid reminder of the biblical mandate to participate in our local congregations. Relevant and encouraging! 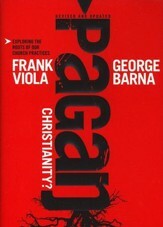 224 pages, softcover from Moody. 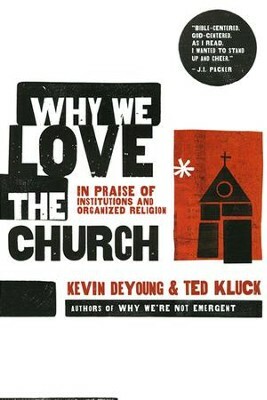 This book presents the case for loving the local church. It paints a picture of the local church in all its biblical and real life guts, gaffes, and glory in an effort to edify local congregations and entice the disaffected back to the fold. It also provides a solid biblical mandate to love and be part of the body of Christ and counteract the "leave church" books that trumpet rebellion and individual felt needs. Why We Love the Church is written for four kinds of peoplethe Committed, the Disgruntled, the Waffling, and the Disconnected. 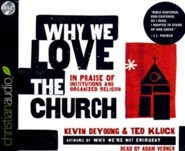 KEVIN DEYOUNG is the senior pastor at Christ Covenant Church in Matthews, North Carolina. He serves as a council member at The Gospel Coalition and blogs on TGC's DeYoung, Restless and Reformed. Kevin is Assistant Professor of Systematic Theology at Reformed Theological Seminary (Charlotte) and a PhD candidate at the University of Leicester. He has authored several books, including Just Do Something, The Hole in Our Holiness, Crazy Busy, Taking God at His Word, and The Biggest Story. 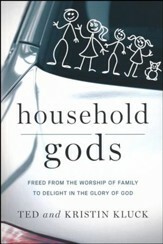 Kevin and his wife, Trisha, have seven children: Ian, Jacob, Elizabeth, Paul, Mary, Benjamin, and Tabitha. TED KLUCK is co-author of Why We¿re Not Emergent and author of Facing Tyson, 15 Stories, Paper Tiger and Game Time. His award-winning writing has also appeared in ESPN the Magazine, Sports Spectrum Magazine and on ESPN.com¿s Page 2. An avid sports fan, he has played professional indoor football, coached high school football, trained as a professional wrestler, served as a missionary, and has also taught writing courses at the college level. He currently lives in Michigan with his wife and two sons. 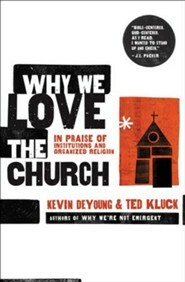 I'm the author/artist and I want to review Why We Love the Church: In Praise of Institutions and Organized Religion.